Purpose: Use this document as a reference for creating a requisition in ctcLink. Audience: College staff with a need to create requisitions. Copying a requisition can save time for repeat orders. Existing information can easily be copied into a new requisition. From the Add New Value tab on the Requisitions page, click Add. Click the Copy From link. 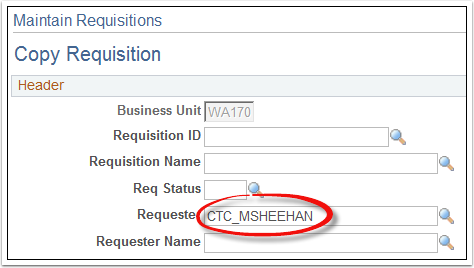 On the Copy Requisition page, enter the Requisition ID of the requisition you wish to copy. If the ID is unknown, use the search fields. 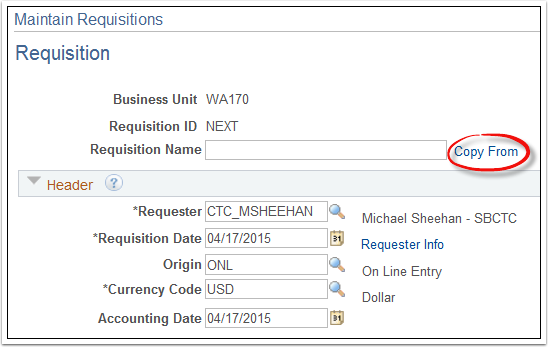 For example, to view all requisitions from a particular requester; enter the name into the Requester field. Click the Search button. All requisitions matching the search criteria will be displayed. Select the requisition to copy and click OK. The current requisition will fill with data from the copied requisition. Carefully review the copied data and make changes as needed. If you are ready to submit the requisition for approval, click the Approve icon at the top of the page. Note the Requisition ID for future reference.